I am really excited to have completed my first pattern! 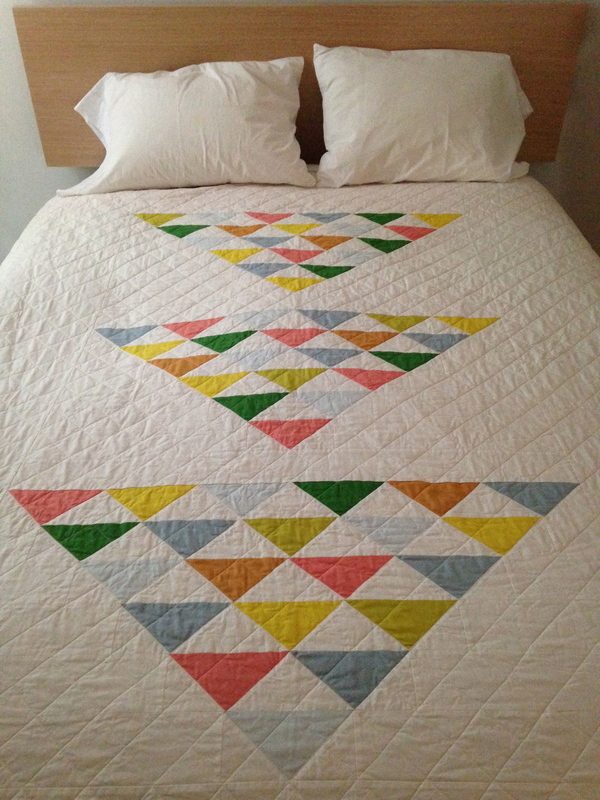 I think the Three Flocks Quilt pattern would be great for an adventurous beginner. It definitely gives plenty of practice in making flying geese blocks! I can see this looking great with a dark background–I have in mind to make a navy crib size (maybe that will be pattern #2). Please leave a comment and let me know what color you would use for the background and I’ll pick a winner to receive the PDF pattern. The give away will close on Monday, August 11, at 5:00 pm. Thanks for participating! The pattern is available for instant download in my Etsy shop. This entry was posted in quilts on August 6, 2014 by brigitdermott. I might use a natural linen color. This pattern is fun…I am liking the triangles these days! Every color pops against a charcoal gray. Thanks! I would use a soft grey…I love this pattern! I would use repurposed denim! I can’t believe I am saying this but I would stick with a white background -I just don’t like the color white; however there is a method to my madness; I love how the white background lays the foundation for the colors chosen in the quilt. I love the orange and the gray and I think the effect wouldn’t be as eye popping if any other color but white was used. I might use the very light blue like you have in your block to mimmick the sky. I think I would like to use a bold green for a background, something like Kona Jade Green. 🙂 Thank you for the opportunity and congratulations on your first pattern!